karl is going down to deer camp this weekend. the camp is in southern arkansas (nashville, home of the nashville scrappers, pronounced nash-vul.) they are going down not to hunt but to clean up camp. because the camp, my friends, has been SOLD. it belongs to family (from mineral springs, pronounced mineral springs, where there is nary a walmart) and they pay dues to hunt every deer season. the past few years have been slim on hunting for k - with work and me and the baby and all, so the news isn't a big shock. dislikes: health insurance companies, comcast (well, bad customer service in general), meatloaf, watermelon, rude people, unsolicited advice (particularly about childbirth and babyraising - it's super cute. ), and america's next top model. 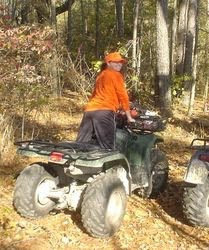 I don't like hunting either and glad my husband doesn't hunt but I do enjoy four wheeler riding! You look like you enjoyed it too.